How Often Should You Wash Your Wig? Home > Wig Help and Advice > How Often Should You Wash Your Wig? Getting the most natural look out of your wig requires more than just a good product and a proper fitting. 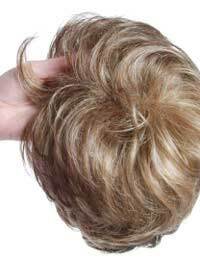 You must also care for the wig correctly in order to ensure a great look wear after wear. You want Your Wig to smell and look fresh every time that you wear it. However, excessive cleaning, styling, and fussing can cause a wig to loose its natural shape, colour and style. So how often should you wash it? The answer ultimately depends on how often you wear it and what type of damage it incurs while wearing. The general rule of thumb for human hair wigs is to wash them after every 10 to 12 wearings. For synthetic hair you can get by with washing after every 15 to 20 wearings. You may need to wash your wig more often under certain circumstances. If you are very active and perspire a lot, if you live in a more humid climate, or if you are around a lot of pollutants, such as car exhaust, cooking grease, or cigarette smoke, you will definitely want to wash your wig more often. In these instances, it is okay to wash your wig after six to eight wearings but any more than that will cause your wig to deteriorate more quickly and loose its shape and style. If you do need to shampoo your wig more frequently, it is important to adhere to the proper cleaning instructions and to use the correct products in order to minimise damage. Before washing your wig make sure that you use the right cleaning products. Special products are needed to clean Human Wigs And Synthetic Hair Wigs. Make sure that the product is formulated for your specific type and style of hairpiece. Before washing it is best to smooth out your wig with a wire brush or wig pick. This will loosen any dirt and grime and make it easier to get your wig completely clean. Next, fill a bucket, basin, or large bowl with lukewarm water (never use hot water as it can damage the wig) and add the appropriate amount of wig shampoo. Gently submerge the wig in the water and allow it to soak for two to five minutes. To rinse, gently swish the wig under clean, cool, running water. Before placing the wig on a head form to air dry blot out the extra water with a towel or other absorbent cloth. Never twist, tug, or pull on the hair when drying. If you need to wash your wig more often than usual, you may want to add a conditioning step to your wig cleaning routine. Specially formulated leave-in conditioners can help keep your wig soft and supple and also help keep it smelling and looking fresh longer. To use simply follow the manufacturer's directions on the bottle. By taking the extra time to properly care for and wash your wig you can extend the life of your hairpiece and keep it looking more natural longer. Find out how to get the right look with your wig in our article Tips On How To Wear Your Wig. My wig gets rubbedd by coat collars etc and is getting to feel (and look like)a brillo pad on the bottom of shouder length wig. Can i just condition it to look softer agaiin?